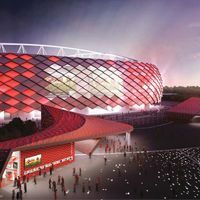 Otkritie Arena won’t cost the estimated RUB 10 billion, but 14 billion ($430m / €312m), said billionaire investor Leonid Fedun during his recent press conference. This might mean a huge 40% increase, but Fedun also suggested that the price tag is for “absolutely everything”. That may also include secondary infrastructure, like the Volokolomskaya Avenue access routes, making the sole stadium price only slightly higher than previously estimated. The price is high, but contrary to other 2018 World Cup projects the one launched by Fedun sees no delays. As predicted, all of the concrete superstructure is ready and entire stadium should be operating in the summer of 2014. The project did see a delay overall, from early 2013 to mid-2014, but that change took place before actual construction work began and since then it’s been growing without major issues. It’s said that Fedun already invested some $1 billion since he took over at Spartak in 2003. Despite his team not winning a single championship title since then, the billionaire recently expressed satisfaction with Spartak’s current level.